Aristotle, the Greek philosopher believed that all matter was made up of four elements. Which one of the following was not one of these elements? the particles spread out and mingle with each other. the particles always come together to react and form a new substance. the atoms making up the gases break apart and spread as far apart as possible. the particles move in a well-defined pattern of motion. Which one of the following is an example of diffusion? When diffusion occurs between two gases such as hydrogen (red) and helium (green), which of the following diagrams best represents what is most likely to occur? In the early 1800s, an English chemist John Dalton proposed an Atomic Theory consisting of a number of assumptions. Four of these assumptions are given below. Which one of these is no longer known to be true? Around the 1870s, this scientist studied mysterious rays in sealed glass tubes. Which one of the following statements is NOT true about the atom? Atoms of the same element may have different numbers of protons. Atoms are the smallest part of an element that still retain the properties of that element. Not all atoms contain neutrons. In the Maltese Cross experiment performed by William Crookes, which one of the following is not true? All of the electrons leaving the cathode are absorbed by the Maltese cross. Electrons leave the cathode under a very high voltage. This experiment shows that cathode rays travel in straight lines. A fluorescence appears on the far end of the screen where the cathode rays strike the tube. Select two answers and click on the Check button. The nucleus occupies very little space in the atom. The nucleus contains neutrons and electrons. The nucleus always has a zero charge. Which property of cathode rays did the apparatus shown prove? Cathode rays are deflected by magnetic fields. Cathode rays have a negative charge. Cathode rays are composed of electrons. Which one of the following is a property of cathode rays? They can be deflected by electric fields. They consist of electromagnetic radiation with zero mass. They are unaffected by magnetic fields. The term 'electron' was first proposed by which physics professor? In 1897, J J Thomson studied cathode rays using an apparatus similar to that shown. The ratio of the charge on an electron to its mass is known as its specific charge (e/m). J J Thomson first calculated this value in 1897. The value for the charge (e) and the mass (m) were later found in 1909 as a result of which famous experiment? a positive charge was concentrated in a small dense nucleus of the atom. atoms contain negatively charged particles. the neutron was in the nucleus of the atom. alpha particles consisted of a helium nucleus with a positive charge. As a result of bombarding beryllium with alpha-particles in 1932, the neutron was discovered. Which scientist is credited with this discovery? 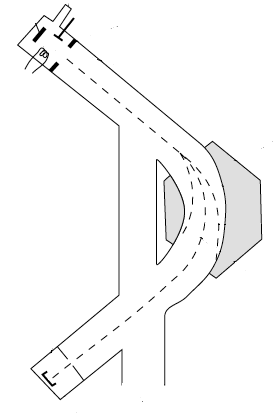 The diagram shows a cathode ray tube. The apparatus used for Millikan's famous oil-drop experiment is shown in the diagram. With reference to this experiment, which one of the following statements is correct? Millikan found that the charges on the oil-drops were a whole number multiple of a basic value. The upward electric force on the oil-drops must be greater than the gravitational force on the drops. The charge on the electric plates does not effect the velocity of the falling oil-drops. This experiment allowed Millikan to determine the mass of an electron for the very first time. The Gold Leaf experiment was carried out in 1911 by Geiger and Marsden. The diagram shows the apparatus used. In 1911, Rutherford bombarded a thin gold foil with alpha particles. As a result of this experiment, the nucleus was discovered. Which one of the following did not happen in this experiment? The alpha particles caused the gold foil to fluoresce. Most of the alpha particles passed straight through the gold foil. Some of the alpha particles were deflected through large angles. Some of the alpha particles were deflected back along their own path. What three pieces of information did he deduce from this experiment? Most of the atom consists of empty space. Most of the atom's mass is concentrated at its centre. The nucleus is at the centre of the atom. The nucleus has a negative charge. Which one of these scientists identified cathode rays as being electrons? Which species represent a pair of isotopes? How many unpaired electrons are there in the Co2+ ion? Which of the following processes occur in the mass spectrometer? 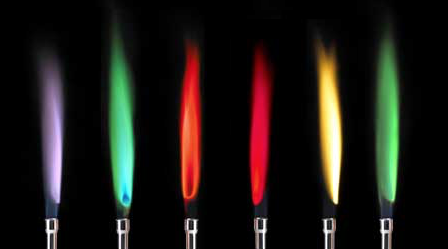 What flame colour do copper ions produce when heated? What is the correct sequence for the stages of operation in a mass spectrometer? 1. The lines converge (are closer together) at lower energies. 2. Electron transitions to n =1 are responsible for lines in the UV region. 3. Lines are produced when electrons move from higher to lower energy levels. In which one of the following pairs do the particles have approximately the same mass? atoms have different numbers of neutrons. atoms have the same mass number. atoms have similar physical properties.